Alaska has yet to see a legal pot sale. But some banks are already shutting down accounts. Not a single gram of legal marijuana has yet been sold in Alaska, but some bank accounts tied to people in the emerging cannabis industry are already being shut down. Citing strict federal laws around cannabis, Alaska USA Federal Credit Union has stopped doing business with an undisclosed number of people linked to marijuana businesses; Credit Union 1 has also closed down at least one account, company officials confirmed. Cole Hollister, co-owner of Fairbanks-based cultivation facility Pakalolo Supply Co. Inc., got a letter in July notifying him his personal account with Alaska USA was being shut down. "It recently came to our attention that you are an affiliate of the marijuana cultivation facility, Pakalolo," the letter says, referencing the company's state marijuana license number. As the first company licensed by the state, Hollister just began growing commercial cannabis in late July. He called the move preemptive and unwarranted. "Nothing's happened yet," he said. "There's no business, there's no income, there's no illegal activity going on." The letter gives a one-month deadline for Hollister to close the account. "It's just standard practice for us," said Dan McCue, senior vice president of corporate administration at Alaska USA. "If it's an account related to the cannabis industry, it's an account that we can't maintain." McCue declined to verify the total number of accounts shut down, although the Fairbanks Daily-News Miner reported 10 personal accounts linked to marijuana-related businesses had been suspended. "It's not just sales," McCue said. "That's the distinction. It's related to the business, so there's all kinds of things you can do to get your business started. We established a policy, we have the right to do that." Hollister said he's kept the account for more than 30 years, and that it serves solely as a personal savings account. He maintains the account has in no way been used for any kind of marijuana business activity. "They have no reason and really no justification to assume guilt," Hollister said. Alaska's banks and credit unions are already staying out of the nascent marijuana industry, but they offer slightly different policies, for now. "We are watching this new business very closely … however, we are not closing accounts held by people who have applied for a license," wrote Patty Mongold, Mt. McKinley Bank president and CEO. Steven Lundgren, president and CEO at Denali State Bank, said that personal accounts wouldn't be closed down for people affiliated with marijuana businesses. "I think those credit unions may be a little more cautious," Lundgren said, referring to Alaska USA and Credit Union 1. In questions to seven other financial institutions, all cited strict federal laws and said they were declining to engage with marijuana businesses. Only Credit Union 1, through a spokesperson, volunteered "at least one" account had been shuttered due to marijuana-related activity. "Already?" said Ken Alper, director of the state Department of Revenue's Tax Division, when told of the closed accounts. "That's a little preemptive. We kind of figured, if the banks are going to be hard on them, it wouldn't be until September," he said, when business really begins. Ancillary companies — those indirectly doing business with cannabis businesses, such as security companies – are considered to be indirectly involved, and will be treated as any other business, the financial institutions agreed. The story has largely been the same in other states. Cannabis bank accounts are opened and shut down, including personal ones belonging to business owners. Marijuana remains a "Schedule I" drug, with the DEA rejecting any changes to its federal status last week. That means although it's legal at a state level, entities that are entwined with the federal government and subject to federal laws, including banks and credit unions, must weigh their risks if or when they engage with the industry. The banking conundrum has been vexing emerging marijuana businesses since it first became legal in Alaska. Alcohol and Marijuana Control Office Director Cynthia Franklin said when President Barack Obama visited Alaska last year that "if I could have two seconds with Obama … I would ask him to fix the banking problem." In 2014, the Department of the Treasury Financial Crimes Enforcement Network published guidance for financial institutions seeking to provide services for marijuana businesses. It requires vigilant monitoring, and there are three different levels of reporting banks and credit unions are required to follow. "The Feds haven't said that we cannot open accounts, and they have not said that we cannot service the marijuana businesses, but they're making it so complicated for us," said Denali State Bank's Lungren, who is also president of the Alaska Bankers Association. If the federal government found a bank was servicing a cannabis business but had been at fault somewhere along the line, it could be subject to fines or criminal penalties. "Nobody wants to be the first in the water" to try navigating the rules, Lundgren said. So what would it take for banks to start accepting marijuana money? "Congress legalizing (cannabis)," Lundgren said. As the industry grows – projected at more than $7 billion this year nationally by the marijuana firm ArcView Market Research — so do the creative solutions. The state of Alaska continues to build a new "cash room" in anticipation of the influx of paper money from people paying taxes with cash. 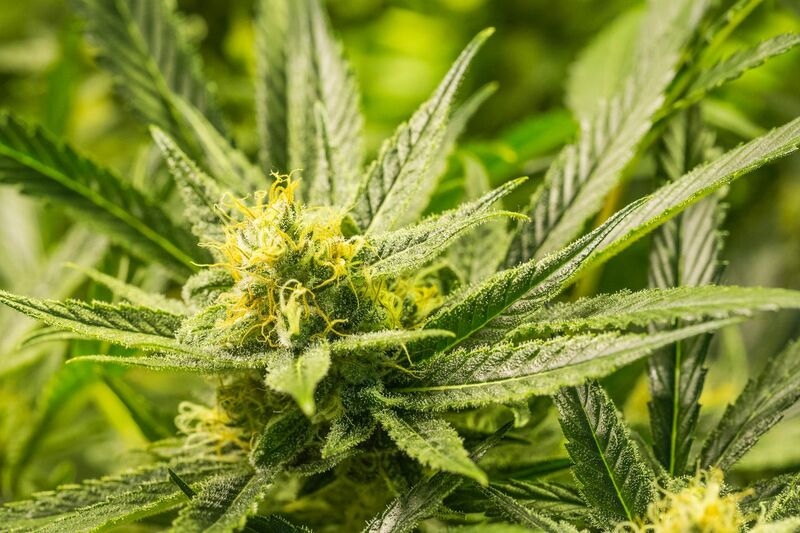 Tax Division Director Alper said the project is anticipated to be completed in October, around the same time Alaska's first commercial cannabis crop will be harvested, and the first retail stores may open. For the tax division's part, it doesn't care whether the money comes from bank accounts, cash, or even credit cards. "We just want to make sure other people are going to be able to pay their taxes," Alper said. And the state doesn't have the same banking woes when it goes to deposit those taxes, as Claire Lettow, regulations specialist, said in 2015. "When the taxpayer gives money to the bank, it's drug money. When we give money to the bank, it's revenue," she said at the time. Larry Clark, the owner of Valkyrie Security and Asset Protection, said many businesses are planning to have cash stored in a safe on-site. Clark's business was set up specifically to aid a cash-heavy industry, a potential security issue. Some have signed up with Valkyrie to handle their cash, Clark said. Valkyrie hopes to also provide its own separate, secure location and vault for cash storage, so businesses don't have to store money on-site. Then, there are the startups looking for their own ways to service the industry, including PayQwick, a California company that would provide a form of debit card, and Arizona-based software development company Hypur, which helps the cash-intensive industry conduct electronic operations. Despite the stance of financial institutions, some marijuana businesses do succeed in using the banking system. In Washington, only 14 percent of the state's retail taxes were paid in cash in fiscal year 2015, while in Colorado, reports say around 60 percent of businesses have bank accounts. Clark said he knew "some of (the businesses) have set up separate consulting companies, separate entities that are not part of their business." For Pakalolo's Hollister, that option is not on the table. "I personally have no interest whatsoever in doing what some of the businesses in Colorado are doing," Hollister said. "I'm prepared for the fact that this is a cash business." Hollister believes eventually, the banking industry will open up to cannabis. "The banks that we've talked to here that are receptive, they're going to get all of our business," Hollister said.